It’s a B&B(& dumplings)! When we arrived, Angela (the owner) and Julia (another staff member) were making dumplings for us and another set of new guests. Every morning, they made a delicious, varied Chinese breakfast (savory pancakes, sesame buns, crullers, steamed veg, egg, etc… nom nom). The design and the décor is meant to represent traditional hutong architecture and style. The room in the pictures is the deluxe suite. Sadly, we didn’t stay there, but we got to take a peek! 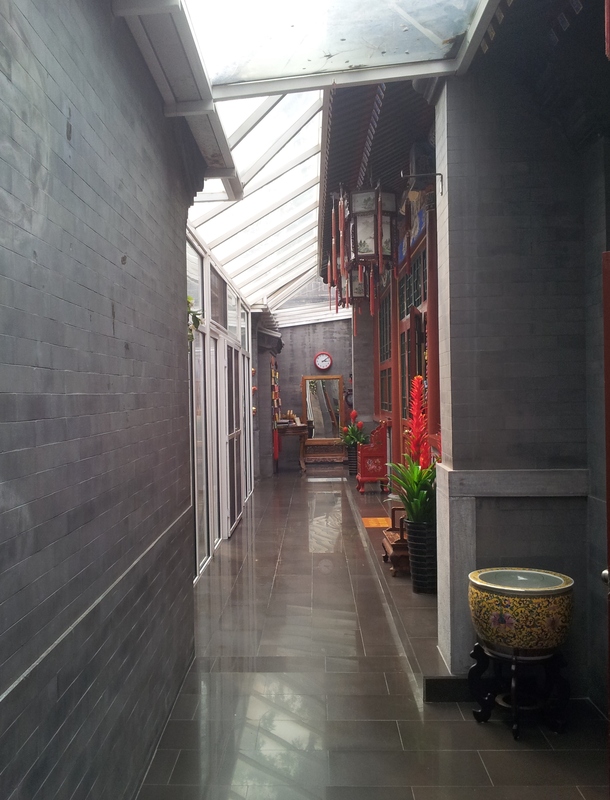 Mao’er 28 is on a safe, quiet hutong (an alleyway lined with traditional courtyard compounds) that’s walking distance to lots of great places. Leaving the hotel, if you walk to the right for about 3 minutes, you’ll come to Nanluoguxiang (South Luogu Alley), a street full of shops, restaurants, and lots of good take-away food (everything from Peking duck wraps to garlic potatoes, to mooncakes and take out mojitos)! Alternatively, walk to the left for 2 minutes and you’ll arrive at a gorgeous stream that leads to Qianhai Lake, lined with traditional houses and willow trees. Further in the same direction is Qianhai Lake. You could spend an entire day just walking around it! It’s lined with restaurants, tea houses (and coffee houses… there’s a Starbucks) and shops. One side is lined with bars and shisha lounges, all of them with outdoor couches and live music most days! The area around the lake is very tourist-oriented, but it wasn’t like anything I’d personally seen before, so I didn’t mind at all! Plus, it is an amazing place to people watch. No need to get on a rickshaw! You can do an easy tour of the neighbourhood by foot. Mao’er 28 is very close to two subway stations, Nanluoguxiang (line 6 & 8) and Shichahai (line 8), so you can easily get around the city and to/from the airport. Stayed in: Early September. It was warm and sunny; some of things I described may be affected by the weather.